Check the Mainspring page for the latest weekly Miramonte newsletter, published every Monday (or Tuesday when there is no school on Monday) during the school year. A letter from Principal Maloon was sent to all families that are currently enrolled for the coming school year. If you didn't receive the email titled "Letter to Families and the 2018 - 2019 Student Handbook" sent on August 7th, please contact the office to update your current email address so you won't miss out on future communications! LOS ALTOS (KPIX 5) Very few schools today give students a chance to take a woodworking class. But at one small school in the Bay Area, every eighth grader looks forward to the time when they can pick up a block of wood, and make something with their own two hands. It’s all thanks to Richard Winslow and Peter Pipe. The close friends and woodworking enthusiasts have been volunteering their own time for the past 16 years, teaching young people at Miramonte Christian School in Los Altos how to sand, cut, and drill wood. For two hours every Friday, rain or shine, it’s woodworking time for the eighth grade class. The men have collected the tools for the class over the years. In the beginning, storage was a bit haphazard, with cabinets full of tools and supplies all over the school. But just this year, space was made for a permanent woodshop location on campus. Like the tools, and class space, the wood is also donated, so the program runs on a tight but efficient budget. Each child only has to pay a ten dollar fee for the year. Everyone makes a pencil holder and a race car, with end-of-class races held yearly. Students also get to choose a third project. Over the years, the kids have built their own book shelves and wooden puzzles. It’s an experience many students say they know they are lucky to have. The students also know the classes would not have been possible without the determination of Miramonte teacher Ronna Sato. She got to know Winslow through church and she saw in him both talent and teaching potential. But Winslow was still working at his day job then. Sato never gave up on her woodworking class idea, and when Winslow left his engineering career, she made her pitch. “As soon as he retired I swooped in and asked him if he thought that that might be a possibility because I’d seen some of the things he’d made,” Sato said with a laugh. That was 2001. Soon after, Winslow talked his old friend Peter Pipe into joining in him. Neither gentleman has looked back since. The students this pair have taught are both proud and lucky. More than 250 students have gone through the class. And both men do other volunteer work. Pipe has made hundreds of wooden toys for the Ronald McDonald House. Winslow works for “Rebuilding Together,” an organization that helps local homeowners having trouble keeping up with the maintenance of their homes. A letter from Principal Maloon was sent to all families that are currently enrolled for the coming school year 2016-7. If you didn't receive the email titled "Summer Update from Mr. Maloon" sent from the office on July 19th, please contact the office to update your current email address so you won't miss out on future communications! 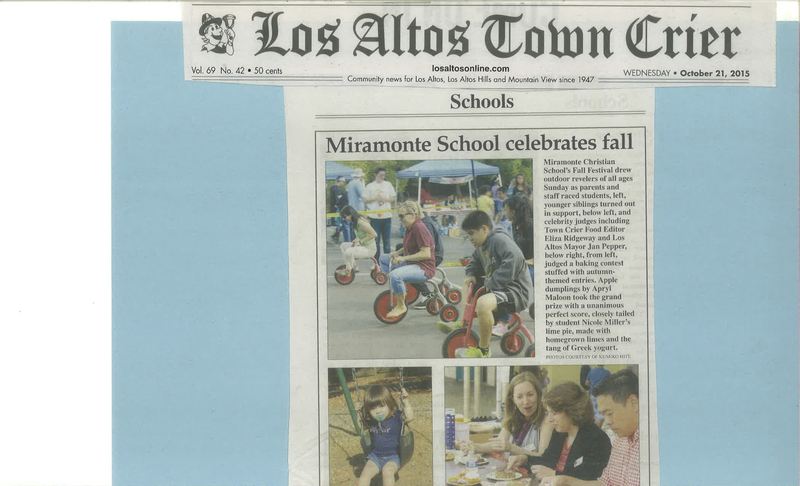 Our local newspaper, The Los Altos Town Crier, had a reporter at the annual Fall Festival who wrote a short feature on the event. A letter from Principal Maloon was sent to all families that are currently enrolled for the coming school year. If you didn't receive the email titled "Letter from Principal Maloon" sent from the office on July 20th, please contact the office to update your current email address so you won't miss out on future communications!